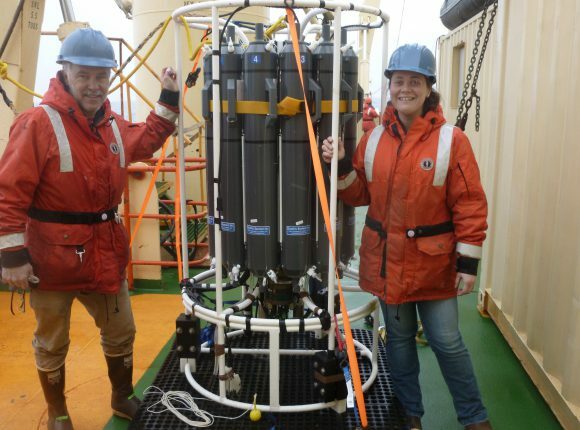 Share the post "Hydrothermal Plume Carries Important Nutrient Over 2,500 Miles in the Pacific"
Professor Robert M. Sherrell, Departments of Marine and Coastal Sciences and Earth and Planetary Sciences-Rutgers, and Jessica N. Fitzsimmons, Department of Marine and Coastal Sciences-Rutgers; assistant professor in the Department of Oceanography, Texas A&M University. Robert Sherrell, from the Departments of Marine and Coastal Sciences and Earth and Planetary Sciences at Rutgers, and a team of scientists have discovered that particulate iron and manganese from the oceans’ largest known hydrothermal plume travel more than 2500 miles across the deep Pacific. Iron is important in the ocean because levels are generally low and phytoplankton are iron-starved over more than 25% of the ocean’s surface. Phytoplankton harvest solar power and are at the base of the marine food chain. 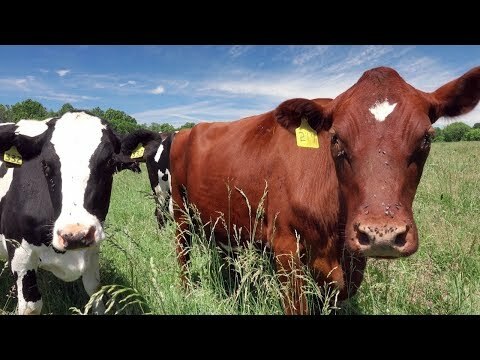 Consequently they provide food for people all over the world. In a report published in Nature Geoscience lead author Jessica Fitzsimmons—a postdoctoral scholar in Sherrell’s lab—described the hydrothermal plume as being a mile and a half down in the Pacific Ocean, and about 600 miles south of the equator. It wafts westward from vents on an undersea volcanic mountain ridge, like a giant smoke plume from an industrial smokestack. The plume begins when seawater percolates into the earth’s crust and reacts with hot magma, then spews out as 700°F hydrothermal fluid and becomes what is called a “black smoker” as the concentrated metals dissolved from the rocks change to fine particles upon mixing with the cold deep ocean water. Illustration of Fe, Mn and 3Hexs transport and transformation along the SEPR hydrothermal plume. In this new study, Sherrell and a team of scientists in the US GEOTRACES program followed the plume along its path, taking thousands of samples to investigate the chemical changes along the plume. The team hypothesized that the iron particles in the plume would not entirely disappear by sinking to the bottom during their journey. It turns out they were right. A portion of the tiny “smoke” particles is carried by deep currents half way across the Pacific, a bit north of Tahiti. 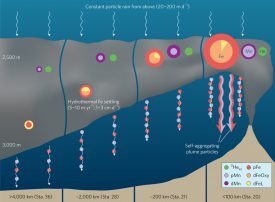 Other team members had discovered last year (Resing et al., article in Nature, 2016) that dissolved iron also persists, so the iron in both particulate and dissolved forms is enriched in deep waters near Tahiti. Another surprise is that both forms of iron descend more than 1000 feet while they are carried west. This indicates that the hydrothermal iron is continuously passed back and forth between the dissolved form and the persistent particles that are sinking at about 2 feet per month, a process that may affect iron distribution throughout the ocean. All of this helps us understand the extent to which hydrothermal venting, which occurs in many places in the deep ocean, helps to fertilize the surface ocean, which provides food for people everywhere and helps the ocean absorb CO2 from the atmosphere.